Homefront Blog: End of the hop! Welcome to the last stop on the hop! 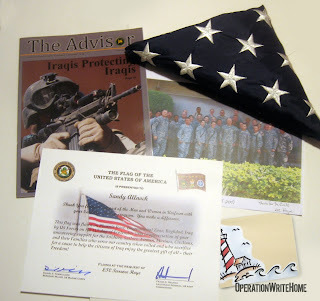 We have a little treat for you...a gift that came to us all the way from Iraq! And the card. Check out his comment in the ps (click on the image to see it large). We've put together some prize packs - FIVE of them! Leave a comment on this blog post and we'll randomly draw 5 winners! Thanks everyone for hopping along with us today —and thanks to all our heroes for all they do for us every day! What a wonderful idea and hop! Very inspirational! Thank you! Great hop! Your flag is wonderful, thank you for sharing it with us! I can't wait to do the whole hop this afternoon, but this came up in my reader and I couldn't resist. Beautiful post and I love his message at the end....I'm off to make some cards! This is such a wonderful cause!!! Wooo!Hooo! I made it through my first ever blog hop. It was soooooo muh fun. Thank you OWH for the wonerful chance to be a part of all of this. Great to have that flag & the words from the hero are even better. it is so heartwarming to hear how much the cards mean to the troops - makes me want to go make more! Thanks for organizing this, Sandy! I made it through the hop. There were some that weren't up yet (I started at 7am est). It was full of great inspiration and awesome people! Thanks for creating such a fun hop! It's always so fun:) And hope a lot of new card makers are generated from it too!! WOW! What a terrific hop! Thanks OWH for a fun adventure. I had so much fun, both as a participant, and as a "hopper" seeing everyone else's creativity! Thanks so much for letting me be a part of it, and count me in for OWH Blog Hop #3! Sandy, what a joyous post and such a blessing you are to many! The flags made my eyes water - what an honor it is to be American and supported by all our fantastic soldiers. Blessings! This has been such a great hop! I've found lots of new ideas, found lots of goodies to buy & have met some awesome people along the way! I couldn't be prouder of the work that you guys do, and my daughter couldn't be more thanksful! We've got another box almost ready to go! THANKS!!!! WOW!!! What an amazing bloghop and such a talented group. This was my first OWH bloghop and I just want to say thank you!!! Thank you Sanday, Fabre and Kris for all that you do!!! You are all heroes! This has been so much fun....and I've learned a lot! Thank you all so much for doing all the hard work of shipping out the cards....you're incredible...and heroes in your won right! Thank you for all you do! I had a wonderful time at my computer and now. . .to more cards! I got so many ideas! How special! This hop was a blast. Wow - I just made my way all the through the hop. There is so much talent and encouragement and support. This is really wonderful. That you to every one at OWH for all your efforts. You truly are Heroes too! all this hop hop stuff has made me very tired, I think I need some chocolate. It's so hard all this drooling....HEE HEE HEE! Wooo! That was fun. I've been through once and a half times now, and have bookmarked several sites to visit again! There sure are a lot of talented folks out there. Thanks again for all the work you do, for bringing us together like this. What a great hop. Thanks to everyone who participated for your inspiration. Time to get crafty for the heros. What an honour to know you've made a difference. This is such a heartening venture. 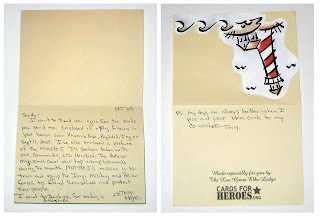 Here in Canada, the painting guild I belong to also creates and sends cards for our troops. They range from painted, thru to stamped and embossed cards in every style imaginable and are received with great appreciation. It's such a little thing we can do for our heroes! Thank you so much for this wonderful blog hop. I am on my way to find out more information on making cards for this wonderful cause! How wonderful! Thanks for sharing that note of appreciation. The blog hop was great. Appreciate all your hard work! What a incredible way to spend my day ... I thoroughly enjoyed visiting all the blogs (well, almost all) and am truly itching to go make some cards for the wonderful soldiers who are in our military! Thank you for setting this up and I'll definitely be sending you some cards very soon! Everyone who was involved in this "hop" is truly a blessing!!! This has been a super bloghop! I made it through every blog and really enjoyed it. 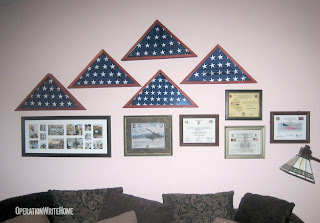 What a wonderful crafty and supportive thing we can do for our troops! God bless them, and you! Awesome hop, I found so much inspiration! I am just so happy that something I enjoy doing so much, can also make someone else so happy! 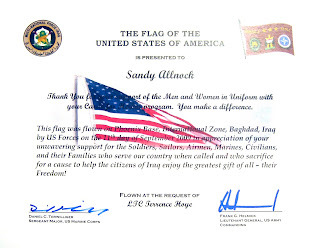 What an honor for you to receive the flag! And the note is really special too. It's great to be part of this blog hop. I'm having fun and meeting some great new people. I hope my blog post inspires some new people to make cards for our heroes. What a great bloghop! Found tons of great inspiration. Now it's time for bed :D it was quite a day! It was so great to see lots of participation. The Blog Hop was a total blast! I am so happy I was able to participate this time, and I won't ever miss another one. It's really inspiring to see all the different styles and ideas and to read the stories and comments. There is so much goodness in this organization. Thanks to everyone who makes it possible! These blogs are really inspirational but there are almost too many...help I am on overload. So much talent..I am humbled by you all. Hope these will stay up for awhile so I can check many of them out again. I'll have to finish the blog hop tomorrow as I've been checking them in between house duties today. I've really enjoyed visiting the blogs and finding new ideas for my own cards. Most of all, it's been incredible to see all the support for OWH and our amazing heroes. This is my first blog hop. I LOVE it. I love seeing how much everyone does for OWH. I love seeing all of the cards. I love hearing the personal stories. Thanks to Sandy, Kris and Fabre for all you do. Thanks Sandy, Fabre and Kris for all you do and to the bloggers for all of their inspiration. I wish you all heartfelt praise for supporting OWH! Great blog hop, but that card from Terry you posted was by far a highlight! Thanks for all your hard work and the opportunity to share my craft and some love with our deployed service members. As a military wife I just have to give a great big thank you for organization this Hop and for starting this organization. It's such a wonderful way to help us feel more connected to our loved ones when they are away - and to help me pass the time when my hubby is away. Thank you from the bottom of my heart. As the daughter of a Retired Air Force Officer, wife of a Retire Naval Officer and now Mother of 2 Army Soldiers (one currently in Iraq, Aunt of an Air Force Officer, I want to thank everyone involved with Operation Write Home, from the organizers to the cardmakers and those that donate time and money to the cause. You are all appreciated by the soldiers and their families. Thank You! As a military wife,sister, and daughter you will never fully understand the gratitude that I have for what you do.Thank-you, thank-you, thank-you!!! How ironic that when my husband was deployed that the first thing he asked me was to make some cards for him. It was only later that I found OWH and began to contibute to such an important cause. Keep up the grat work! This has been my first blog hop ever! I am an AIr Force wife of 20 years currently overseas in Japan and I am so excited to start making cards to send to Heroes. Thanks for all you do. Thank you for sharing that card with us and letting us know how much our troops appreciate the cards. It's so nice to know that a simple thing that I love to do like making cards can brighten the day of our troops. Plus a chance to win candy WoW! Wow. You must be bursting with pride! Awesome gift you've received, but it's nothing compared to the gift our military personnel have received from your service. This hop was divine! I loved seeing every project, and have marked so many to go back to visit. Just inspiring, humbling, genuine. Thanks again for all you do!! Thank you ladies, for such a great hop! THis will all translate in to a lots of smiles for our heroes and their loved ones, no doubt! Wonderful Bloghop!! It is so fun to see all the different cards! What a fantastic way to support our troops! Thank you for OWH. I have a son in the USAF and know how much it means. I love naking the cards to send to you and receive a blessing from doing so. Thanks for organizing this wonderful event again. I am so grateful for everyone's sharing their creative inspiration from their warm hearts. Thanks to heroes! Another great hop, Sandy. Love seeing all the support and creativity that is out there. I get so inspired from all the cards and every time you post a response from a hero or their loved ones, it makes me cry and a little proud to part of the OWH family. Thanks for all you ladies do! i did half of the cards yesterday and hakf today. so many great cards! Thank you so much for including me in your hop, I hope to inspire more ladies to join in your great program! What an amazing honor! I am totally honored to use my talent to share with others the gift of hope and love! I am only one, but I can send love and gratitude thru a simple greeting card! Thank you for including me in this awesome HOP!!! Have a great one! I love these hops. I love the inspiration since I am fairly new with making cards. What an amazing group of card makers, such dedication and love for our heroes. Everyone did a wonderful job. A special shout out to the ladies who are the glue of this organization, Sandy, Fabre and Kris. Thank you for all the time you devote to this project, I can't even imagine how much work it takes to mail out all the cards. None of this would exist without you. My only request would be could the blog hopstay open for a week....lol. That's awesome! I really enjoy making cards and it feels great knowing that my creations are making someone else's day brighter! Thanks for all your hard work in sorting and sending these packages. I am constantly amazed at how many cards are mailed out each week!! What great fun! And five flags! Wow, that just goes to show what a great job you guys are doing!!! I have a package almost ready to send. Thanks for all you do. That is amazing! Congrats on the 5th flag!